Short story writing is not everybody’s forte. The author has to do a tightrope walk while trying to say so much in so little. This genre, which is increasingly getting popular along with other extreme variants like flash fiction and micro fiction is undoubtedly a reflection of our busy times. Shuma Raha’s book makes up a fascinating and enjoyable series of 13 short stories about ordinary men and women. It also demonstrates Raha’s dexterity with locations and themes and her ability to tell straightforward stories while portraying human life. Our carefully assembled identities are nothing but cleverly camouflaged facades having emotionally deprived interiors. 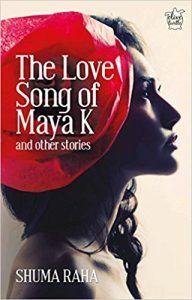 In ‘Love Song of Maya K’, a story that takes its title from the book, Shuma Raha exposes the complexity of sexual relationships but by only hinting at it. The story reflects a metropolitan experience. It has one character displaying veins of feminism while another a hesitantly liberated attitude. Being a ‘recent migrant to the capital’, Maya finds a harbinger in Jamila who navigates her through the liberal echelons of Lutyen’s Delhi. Having walked out of a relationship with longtime boyfriend Sudeep, Maya knows she has to go straight to Jamila—since ‘you could always count on Jammy’. In a detached way she floats from Sudeep to Jamila who is waiting to hold her hand and lead her into her ‘austere parlour’. Maya and Jamila tread the difficult path between desire and established societal norms. They disobey the boundaries of a preconceived map and meander to find love in unknown places. In ‘Smell the Coffee Beans, Please’, Sandhya travels between her twin identities of being born in a typical Indian middle-class family and her job in a much sought after up market perfume salon. The story is about the ramblings of a salesgirl who finds herself drawn towards each of her westernized rich male customers. Sandhya keeps daydreaming about an affair with the gorgeous men she encounters at her desk every day. She allows her imagination to run riot with the possibilities that a life with them can hold for her. She is repeatedly confronted not merely by the class difference between her and the affluent customers but also with her redundant, mundane relationship with her current boyfriend Abhishek. He is devoted to her but she doesn’t value him till she spots one of her imaginary ‘knights in shining armour’ in suspicious circumstances one night. By contrast another story, ‘The Kill’ has an unsettling echo. Set in the times of Gaurakshaks and their mindless frenzy, it is also a cautionary tale of what awaits a society that allows itself to be divided. What lifts the story above the ordinary is Rohit’s rise and fall in the face of growing fundamentalism. The end is also an indication of the frailty of the individual and the community. Rohit’s infatuation with Raushni and the tenderness he feels towards her mother for feeding him occasionally when he was a kid is contrasted by the hatred for her father Kamal Shah for having eaten the ‘forbidden’ meat. His personal grudge finds a good excuse in the collective rage and he falls in line with the surging mob. The social change in India of neighbourhoods moving from inclusiveness to individualism captured in this story is insightful. A bed becomes a metaphor for the reassuring times that an old couple is desperately seeking. In ‘The Leaving’ an elderly couple Sumitra and Bimal reminisce about the life in their home of 50 years, which they are now about to sell. Bouts of nostalgia grip them especially Sumitra, who finds it difficult to come to terms with this ‘last big change in their lives’. Mired in a lost time, there is a return to the good old days but only in memory. When the son from the US and their daughter from Mumbai descend with their families during vacations is the only time when life ‘rings through the house’ which otherwise ‘rattles and creaks’. It is an Indian story to an Indian audience who can instantly relate to its central issue of neglect and loneliness among the elderly. The story unfolds the dismantling of memories and memorabilia like the Jamini Roy paintings, the family silver and especially the large Queen Victoria bed, a wedding gift given by Sumitra’s late father-in-law that she cherishes so much. But amidst all the chaos of shifting location, Sumitra finds Bimal’s ‘black leather-bound note-book’ in which he used to scribble poems that he called ‘musings’. Leafing through it Sumitra manages to locate her own self and also a mysterious ‘other’ whom she does not recognize. She slowly realizes the futility of hanging on to faded memories and burdensome beds! Raha manages to bring out the psychological complexities faced by the protagonist who spirals down the moral pit till it hits him where it hurts the most. ‘Possessed’ is about middle-aged Professor Sinha and his escapades with a nubile nymphet named Payal, who sets a trap for him through the social media. His misadventures in the troubled past are like scars that come to haunt him time and again. He is led astray by his passion and unbridled desire despite having narrowly escaped persecution for a similar incident in his previous workplace. He soon realizes that he has landed himself into great trouble. The twist in the tale comes when one day he accidentally sees his young son dating Payal. In ‘April is a Cruel Month,’ Sona crosses all social boundaries to marry Rafi hailing from a class much below her both economically and socially. She goes ahead with her strong love for this man from a Muslim community, much against her parents’ wishes, only to despair in no time.Raha manages to drive home the all-too-human aspect of the feeling of love that many feel should be magical and eternal, but often isn’t. He also grabs the attention of the reader by revealing a great deal in the last sentence where Sona overhears her father plotting but she chooses to look the other way. Chitralekha and Vijay are on a train journey from Gwalior to Delhi by Samta Express in ‘The Trip’, perhaps the most absorbing story,which captures the roughening edges of a typical B-school romance between the two protagonists. Their busy corporate life and the ambition to climb the professional ladder somewhere have taken a toll on Lekha’s dream to have a family of her own. Lekha’s longing for intimacy with her taciturn husband is accentuated by her chance encounter with a pair of lovebirds sitting on the opposite side.Will Vijay ever be able to warm her ‘chilled’ heart? Will a child really make a difference in their ‘grey’ lives? However, some stories in this collection lack sharp etched themes like ‘Do They Have a Merc?’ It lacks critical merit and reminds one of an episode from Ekta Kapoor’s insipid soap operas. Raha manages to hit on all the vagaries of romance, revenge and nostalgia in her debut collection of short stories with a fair amount of insight. The author has credibly captured the idiosyncrasies of the characters in most of the stories which are a rewarding read if you are not searching for deep musings. One wishes that the stories had been allowed to grow organically and the characters allowed to fill into their skin, so that the readers could get some more meat to chew upon. Bhanumati Mishra teaches English Literature at Arya Mahila P.G. College, Banaras Hindu University, Varanasi. She is a translator, poet, critic and an artist. She is the author of Amitav Ghosh and His Oeuvre.